Attention all ye hoodlums, thugs, and general ne'er do wells: the days of the wooly ski mask are over—at least, over for 333 of you. 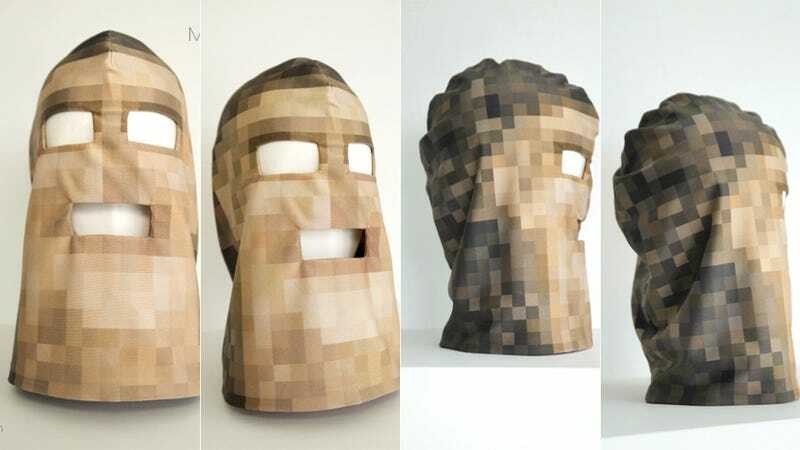 Jack-of-many-arts artist Martin Backes has, after a year-long process, finally completed a work he is calling "The Pixelhead." Created in a limited edition collection of 333 units, this fully-pixelated face mask/hood is made of highly non-fade polyester (80%) and elastane (20%). Each is hand sewn in Germany and can be purchased for approximately $192.00, with shipping to anywhere in the world. The full face mask Pixelhead acts as media camouflage, completely shielding the head to ensure that your face is not recognizable on photographs taken in public places without securing permission. A simple piece of fabric creates a little piece of anonymity for the Internet age. The material used is elastic fabric for beach fashion and sports gear with a fashionable Pixel-style print of German Secretary of the Interior Hans-Peter Friedrich. The mask has holes for your eyes and mouth, so you can see and breathe comfortably while wearing the mask, secure in the knowledge that your image won't be showing up anywhere you don't want it to.